Have you ever wondered how to get 'that high end look" from your own home decor? Do you look at the homes of other people or magazine pictures and think "I want that", but just don't know how to get it, or even what 'that' really is? You just know it's different, and it feels different, and you like it. As a designer with a professional soft furnishings workroom, the most popular request I get when it comes to planning the fabric items of the house is that they want it pretty, but it has to be practical, and it has to be affordable. Hmmm, pretty AND practical.................seems like I've heard that somewhere before. One of the things I tell my clients on a regular basis is that, if it's important enough to you that you've ordered custom, then really make it custom. Take that pretty fabric and dress it up. Give it some bells and whistles. Add a bit of the unexpected. Make it beautiful, and make it special. It's all in the details. Really, it is. Even if you aren't working with a professional, you can do this. If you can sew, you can definitely do this. Let me show you some examples of adding the right touch to the right treatment. 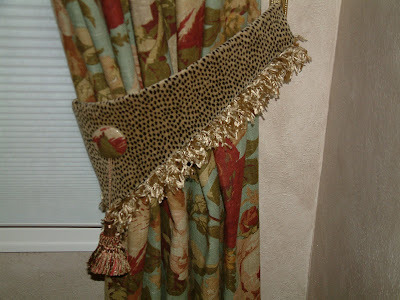 Now I could've made this tablerunner out of the leopard print and just brought the edge to a point, put a tassle on it, and it still would've been pretty. But that's just not me. Once you get to know me, you'll learn that I cannot be satisfied with one fabric on one product. In fact, I'm well known for my pattern mixing around these parts. 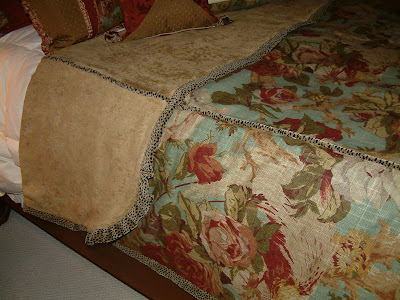 To add the custom touch to this runner, I brought in the use of other fabrics in small touches. I added a bit of gimp to separate the fabrics, and then added wonderful little metal pieces (from Lowe's), and topped those off with a round black button. I finished it off with fluffy multi-colored tassels on the ends. I wish I had a close up of this pillow. I did it a few years ago, and this is the only picture I can find of it. Anyway, this starts out as your basic roll pillow. Where you would normally close off the ends, I extended the fabric an additioanl 16". I added a heavy tassel fringe to the edges to weigh it down nicely. I then covered a button in the same fabric as the banding on the pillow, and pulled the fabric up in a folded fashion and sewed it all down with the button. There is nothing special about the cut of the extended portion of fabric. The look comes from the way you fold it. This client wanted red chenille pillows. She was quite excited when she got these instead of solid red chenille pillows. All is takes to get this look is a few small pieces of additional fabrics in the corners and along the edges. 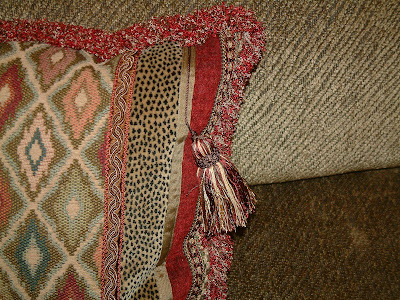 Throw in a couple of trims and add a full brush fringe, and you have a beautiful sofa pillow. Same concept, different layout. This is just strips of fabric sewn together with gimps separating the patterns. I added a tassel on the front instead of at the corners. (I pulled the tassel away so you can see how it's sewn down. I zigzaged over the cord with matching thread so that it would stay in place.) This has a springy ribbon fringe on it. 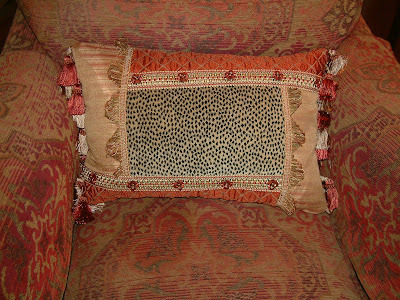 If you're leary of adding too much to your pillows, at least do something to them so they don't look store bought. Here I just added two rows of gimp and put tassels in the corners. I finished these off with a heavy braided rope cord. This pillow has three fabrics and three trims. Selecting fabrics that compliment each other without being too matchy, will always give you a nice look. Make sure your trims don't compete with each other in color or scale. This is one of those fabrics that made me hyperventilate. This is my very favorite fabric EVER. I ended up using it for my living room drapery. 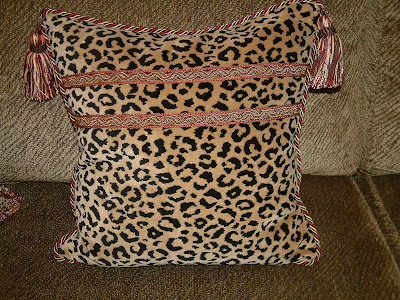 A lot of people ask about how to incorporate animal prints in their decor without using too much of it. This is a good example of that. This duvet cover is one fabric on front, one fabric on back, but it's separated with just enough of another print to make it stand out. Without the contrasting trim, this duvet cover wouldn't be too exciting, would it? Notice how the rounded corners have a soft gather in the trim. You can even jazz up tiebacks. I cut this one at a sharp angle that comes to a point in the middle. 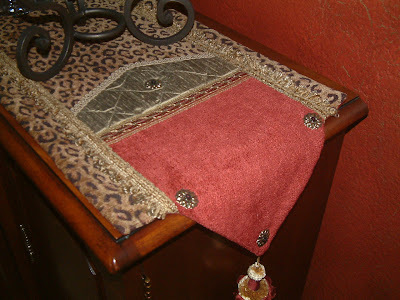 I then added an eyelash fringe to the edge a hung a tassel over a button covered out of the drapery fabric. Pretty, huh? That's it for today. I hope I've inspired you to add a twist to your decor. Remember to keep making it beautiful! Gorgeous! I love that fabric too. You really do a beautiful job embellishing everything you sew. :) Can't wait to see what you do in the future. Oh Polly, I came over on a recommendation from Rhonda, and I am SO GLAD I did....what gorgeous work you do and such a great eye for detail! I look forward to reading more!! Oh...I love your creations...I adore your attention to detail!!! 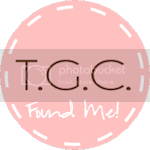 I am sooo looking forward to following your blog and seeing all the wonderful goodies you create!!! Thank you for all of your nice comments. I've wanted to start this blog for a while but just haven't had the time. I'm so glad I did because everyone has been so welcoming. I look forward to a long blog relationship here. Thank you again. Gosh, Polly .. I am so new at this blogging thing and then I "hit" your site and feel so inadequate! WOW ... the details have it!! Beautiful work!! I will return! Omgsh, Polly ... I signed off and was thinking about your blog and it hit me! 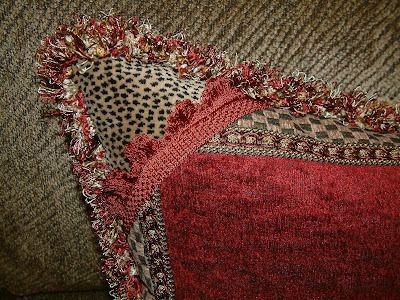 I have a set of leopard pillows that I use so seldom ... 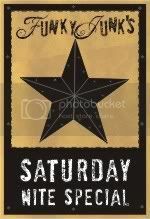 I am going to the fabric store and get me some gimp and cord and "re-do" my living room! My thoughts at the moment are to just use one in the living room and then do the other room to add some punch in the bedroom .... ggrrrrrrrrreat!! Thank You! um num. that'smy kind of designer.absolutely love the fabrics and what you did. On the scarf love those colors. Gads girl you have vision. 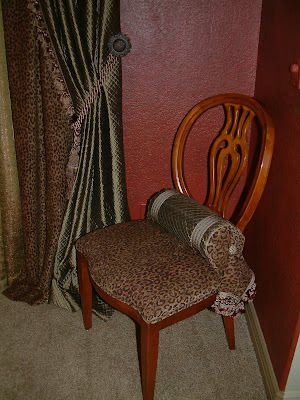 I saw some curtains in a book once with triming of leopard print and Iloved it, I love these too. Ilove your eye for detail. I am so glad I happened on to your blog. Thanks for sharing.